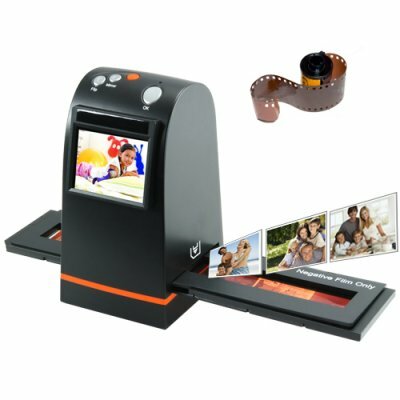 Successfully Added 35mm Film Scanner with LCD and SD Card Slot (Stand Alone Model) to your Shopping Cart. Film scanner for 35mm negatives, slides and roll film. Turn your old 35mm film into modern digital photos. With this new stand alone film scanner, now you do not even need a computer to convert your old 35mm pictures into digital files! Are you an old time photo hobbyist? Or perhaps your parents or grandparents have a rich collection of old film that you would like to bring into the digital age. Well, instead of taking those old 35mm slides and negatives and paying $2 each to have them scanned by the local shop, now you can do it yourself for a fraction of the cost! With the G111 35mm Film Scanner with LCD and SD Card Slot you can digitize all those precious memories at the comfort of your desk. Why would you want to digitize old film and slides? Lets face it, what is the point of taking beautiful photos if you cannot share them with people. Whether you need to give some archived photos to a business client or to your family members, it is very inconvenient to develop your old film rolls yourself or take them to the local photo shop every time you need some new prints. Now in less than 4 seconds per picture, you can turn any old 35mm photo into a 4.2MP rich color image. This is the quickest, cheapest and most convenient way to share old pictures! There is an additional benefit of using the G111 to digitize those old photos - safety. If you lost those old 35mm photos due to fire, theft, or simple age decomposition, they are lost forever, which would be devastating. However, once you digitize them into JPG files they can be copied, moved, duplicated freely with a simple click of a mouse. This is really a small investment in both convenience and safety for all those irreplaceable photos. If high quality and speedy film scanning wasn't enough, this model film scanner also has an LCD viewscreen plus TV OUT which allows you to view the film you are working on as well as photos saved on the inserted SD card. With a one button touch you can do a slideshow review of all your newly saved photos for more efficient work or entertainment. The new G111 35mm Film Scanner with LCD and SD Card Slot simply is the best way to turn your old roll film, slides and negatives into new photos. Don't forget to check out our upgraded model the CVKB-G284 which features a higher resolution image sensor for just a few more dollars. How do I get started using this product? We have included a step-by-step picture (see above). Basically, you put your film or slides in the appropriate tray, insert and SD card into the machine, slide your tray into the tray slot until the viewscreen shows a full image to your liking, click the save button, and now you have a JPEG of the picture. Simple as that! Do I need a computer to use this product? NO. This is designed as a stand alone product and saves the scanned images as JPG files onto your inserted SD card. How many scanned files can I fit onto my 8GB SD card? 8,000. In other words, you can figure a ratio of 1,000 pictures per 1G memory (1000/1G). It is very fine scanner, very easy to use, good quality. on 2010-05-18 22:06:08 A very practical, useful & time saving product. Before this product came out, It was tedious and labouries. One had to use a set up of digital camera and supporting equipment in order to capture the negative image to digital form. Highly Recommended for simple use, good quality. My father who is 83 found this scanner to be easy to use. He has scanned hundreds of slides going all the way back to the late 1950's with great success. I thought a higher DPI might be needed, but not so. This scanner is great! We are very happy with this latest technology. Simple to use.